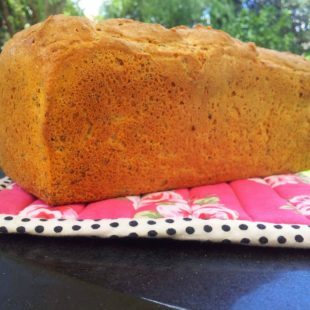 In the years since first making my Original Gluten Free Bread recipe, it still is a staple in our house. Even though I am now mostly paleo in my approach the rest of the family love this bread. This recipe is the latest version. It remains easy to tweak so that it is “failsafe” for kids who need a low food chemical diet, and it is certainly many times better than any commercial gluten free or grain free bread on the market. This recipe uses pseudocereals (also called pseudo-grains, I’ve talked about it before here and here.) Here is my take: quinoa and buckwheat are not approved if you are paleo, on GAPS or SCD or are doing a Whole30. They don’t work for everyone, I completely agree. 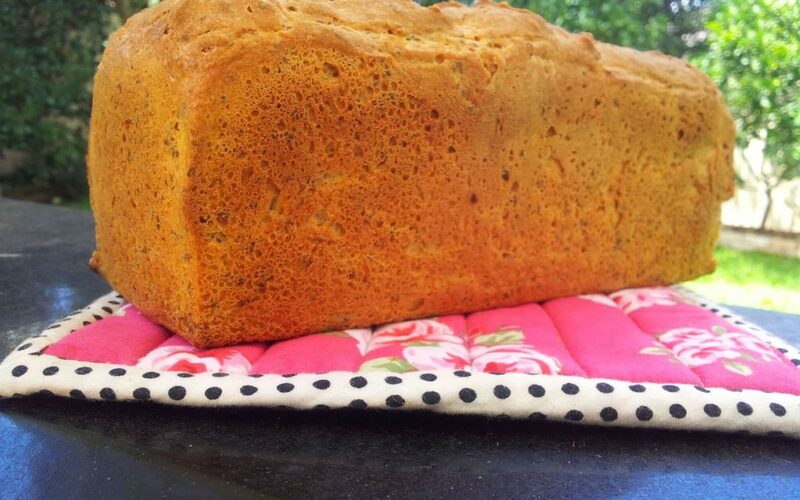 However, this recipe is provided for everyone who loved the original recipe and would like the new version of a nutrient dense, great textured, grain-free bread that is low food chemical and soy free. Using lighter flours like more potato or tapioca starch will mean you will need less water. Add it a bit at a time until you get the right sticky falling slowly off the spoon consistency. If it’s too runny your bread will over rise when cooking and then collapse when cooling). Using heavier flours like more buckwheat, quinoa, amaranth etc will mean you may need more water. Add it a bit at a time until you get the right sticky falling slowly off the spoon consistency. If it’s too dry your bread will not rise when cooking and then have the consistency of a brick. 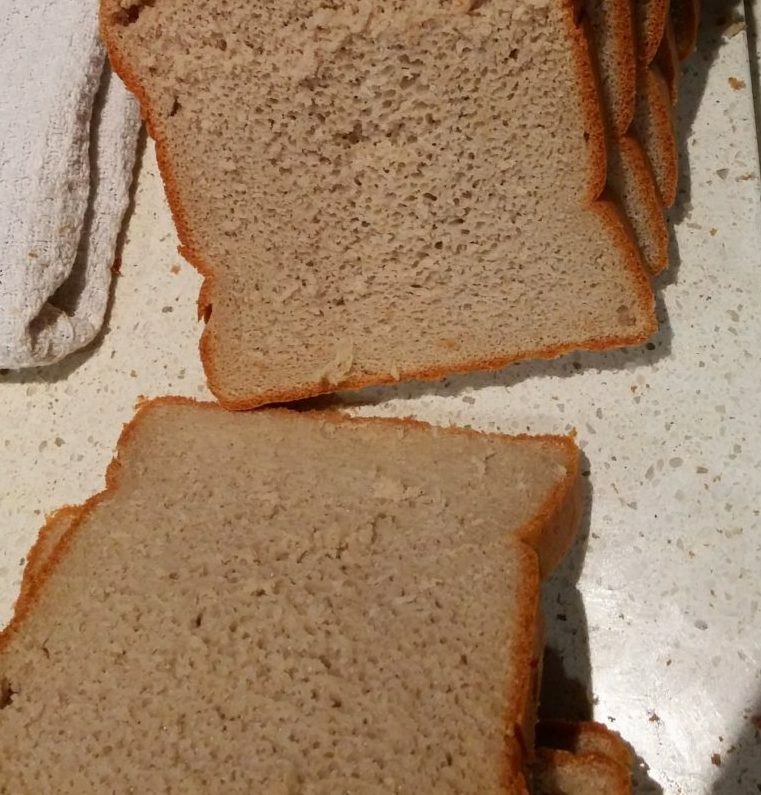 Don’t use too much tapioca flour, it results in a gummy bread. If you don’t want to use xanthum or guar gum, try replacing it with a chia seed gel (soak 1 tablespoon of chia seeds in 3 tablespoons of water for 20 minutes until a gel forms) or use “pixie dust”. You may find you need to use less water if you omit the gums. The 2017 update for the original gluten free bread recipe. 2 tsp xanthum or guar gum gum or replace with "pixie dust"
360 ml warm water may need more or less depending on flour mix and if eggs/gums are used. Sift or whisk all the dry ingredients in a large bowl. Add the yeast and make sure it is well combined/mixed. In a separate jug combine warm water with the oil. Add water/oil to the dry ingredients and beat with a wooden spoon until well combined. Stir it really well. It is important that the ingredients are really well mixed. You are looking for a sticky SLOW fall off the spoon consistency. If you need to shake the spoon for the dough to fall, it’s too dry, add more water. Cover loosely (I use a plastic shopping bag) and leave to rise in a warm spot, about an hour or more depending on temperature. Preheat the oven to fan forced 200ºC or convection 220ºC. Cook 200ºC for 30 minutes then reduce the heat to around 180ºC for 10 minutes then take the bread out of the tin and put back in the oven for a final 10 minutes (50 minutes in total). This ensures that it is well cooked all the way through and gives a nice crust on all four sides. The bread is cooked when it sounds hollow on all sides when you tap with your knuckles. Grease and line a loaf tin, I use a standard bread loaf tin. Turn to your dough mode and closed lid position (the little icon that looks like wheat) and knead for 2 mins. About 10 minutes before fully risen turn on your oven to 200ºC fan forced or 200ºC Convection. Cook for 30 minutes at this heat then reduce the heat to around 180ºC for 10 minutes then take the bread out of the tin, turn it upside down and put back in oven for a final 10 minutes (50 minutes in total). The loaf should sound hollow when tapping and have a nicely browned crust. Egg is optional but helps give a nice texture to the bread. Refer to comments above for replacements for gums and eggs. For failsafe use rice malt syrup or approved sugar instead of honey, and use an approved failsafe butter or oil. Make sure your flour and starches do not contain any added preservatives.